Call Us: 1-800-245-0220 Fax Us: 412-461-2156 Current Customer? Log in or create your account. Three Rivers Supply Co., Inc.
100 YARD ROLLS. 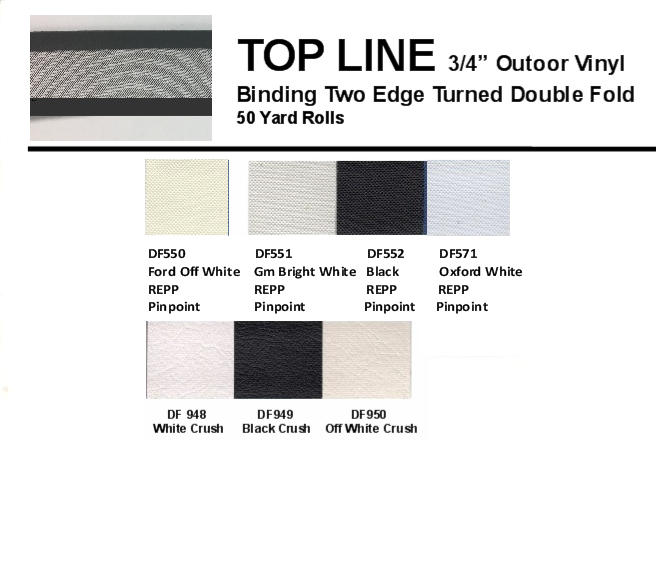 THIS 3/4" DOUBLE FOLD BINDING IS MANUFACTURED FOR AUTOMOTIVE CONVERVIBLE TOPS BUT IS ALSO GREAT FOR ALL OUTDOOR BINDING APPLICATIONS.